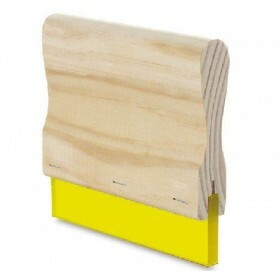 The screen printing squeegees is an indispensable accessory in the screen printing process. This squeegee blade allows you to stretch the ink on the screen and personalize t-shirts or items. In our online store you will find two types of squeegees for screen printing: the squeegees with a wooden handle and the squeegees with the aluminum handle. Both of variable length and equipped with vulko, the polyurethane rubber that allows the ink to pass through the screen printing screen frame meshes and then print. 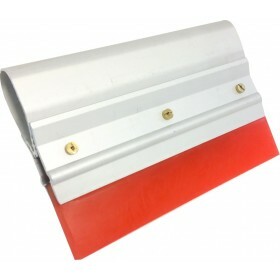 All of our screen printing squeegees are already mounted and you can easily choose the length and type of handle. Choose from our catalog the best screen printing squeegees at the best prices on the web. 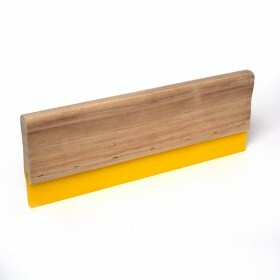 Squeegee for Screen Printing. The secret to obtain a perfect print To the eyes of inexperienced .. The Vulkollan rake made of aluminum resists to solvents and is suitable for most inks. It has an exc..